As Turkey's ruling Justice and Development Party (Adalet ve Kalkınma Partisi, AKP) begins its seventh year in leadership, Turkey is no longer the secular and democratic country that it was when the party took over. The AKP has conquered the bureaucracy and changed Turkey's fundamental identity. Prior to the AKP's rise, Ankara oriented itself toward the United States and Europe. Today, despite the rhetoric of European Union accession, Prime Minister Recep Tayyip Erdoğan has turned Turkey away from Europe and toward Russia and Iran and reoriented Turkish policy in the Middle East away from sympathy toward Israel and much more toward friendship with Hamas, Hezbollah, and Syria. Anti-American, anti-Christian, and anti-Semitic sentiments have increased. Behind Turkey's transformation has been not only the impressive AKP political machine but also a shadowy Islamist sect led by the mysterious hocaefendi (master lord) Fethullah Gülen; the sect often bills itself as a proponent of tolerance and dialogue but works toward purposes quite the opposite. Today, Gülen and his backers (Fethullahcılar, Fethullahists) not only seek to influence government but also to become the government. In 1998, Fethullah Gülen left Turkey for the United States, reportedly to receive medical treatment for diabetes. Since his voluntary exile, Gülen has resided on a large, rural estate in eastern Pennsylvania, together with about 100 followers, who guard him and tend to his needs. It is from his U.S. base that Gülen has built his fame and his transnational empire. Today, Turkey has over 85,000 active mosques, one for every 350 citizens—compared to one hospital for every 60,000 citizens—the highest number per capita in the world and, with 90,000 imams, more imams than doctors or teachers. It has thousands of madrasa-like Imam-Hatip schools and about four thousand more official state-run Qur'an courses, not counting the unofficial Qur'an schools, which may expand the total number tenfold. Spending by the governmental Directorate of Religious Affairs (Diyanet Işleri Başkanlığı) has grown five fold, from 553 trillion Turkish lira in 2002 (approximately US$325 million) to 2.7 quadrillion lira during the first four-and-a-half years of the AKP government; it has a larger budget than eight other ministries combined. The Friday prayer attendance rate in Turkey's mosques exceeds that of Iran's, and religion classes teaching Sunni Islam are compulsory in public schools despite rulings against the practice by the European Court of Human Rights (ECHR) and the Turkish high court (Danıştay). Both Prime Minister Erdoğan and the Diyanet head Ali Bardakoğlu criticized the rulings for failing to consult Islamic scholars. Gülen now helps set the political agenda in Turkey using his followers in the AKP as well as the movement's vast media empire, financial institutions and banks, business organizations, an international network of thousands of schools, universities, student residences (ışıkevis), and many associations and foundations. He is a financial heavyweight, controlling an unregulated and opaque budget estimated at $25 billion. It is not clear whether the Fethullahist cemaat (community) supports the AKP or is the ruling force behind AKP. Either way, however, the effect is the same. Born in Erzurum, Turkey, in 1942, Fethullah Gülen is an imam who considers himself a prophet. An enigmatic figure, many in the West applaud him as a reformist and advocate for tolerance, a catalyst of "moderate Islam" for Turkey and beyond. He is praised in the West, especially in the United States, as an intellectual, scholar, and educator even though his formal education is limited to five years of elementary school. After receiving an imam-preacher certificate, he served as an imam, first in Erdirne and later in Izmir. In 1971, the Turkish security service arrested him for clandestine religious activities, such as running illegal summer camps to indoctrinate youths, and was, from that time on, occasionally harassed by the staunchly secular military. In 1981, he formally retired from his post as a local preacher. To build an image as a proponent of interfaith dialogue, Gülen met Pope John Paul II, other Christian clergy, and Jewish rabbis and emphasizes the commonalities unifying Abrahamic religions. He presents himself and his movement as the modern-day version of tolerant, liberal Anatolian Sufism and has used the literature of great Sufi thinkers such as Jalal ad-Din Rumi and Yunus Emre, pretending to share their moderate teachings. Quotes from their teachings adorn Fethullah's Gülen's propaganda material. The movement, its proxy organizations, and universities—including Georgetown, to which it donates money—hold conferences in the United States and Europe to discuss Gülen. In October 2007, the British House of Lords feted Gülen with a conference in his honor. 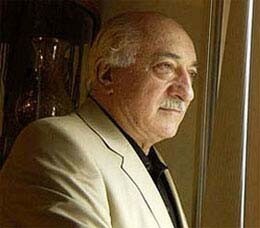 In 1998, Gülen departed for the United States, reportedly to receive medical treatment for diabetes. However, his absence also enabled Gülen to escape questioning on his indictment in 2000 for allegedly promoting insurrection in Turkey in a series of secretly-recorded sermons. Since his voluntary exile, Gülen has resided on a large, rural estate in eastern Pennsylvania, together with about 100 followers, who guard him and tend to his needs. These servants are educated men who wear suits and ties and do not look like traditional Islamists in cloaks and turbans. They follow their hocaefendi's orders and even refrain from marrying until age fifty per his instructions. When they do marry, their spouses are expected to dress in the Islamic manner, as dictated by Gülen himself. It is from his U.S. base that Gülen has built his fame and his transnational empire. The core of Gülen's network is his educational institutions. His school network is impressive. Nurettin Veren, Gülen's right-hand man for thirty-five years, estimated that some 75 percent of Turkey's two million preparatory school students are enrolled in Gülen institutions. He controls thousands of top-tier secondary schools, colleges, and student dormitories throughout Turkey, as well as private universities, the largest being Fatih University in Istanbul. Outside Turkey, his movement runs hundreds of secondary schools and dozens of universities in 110 countries worldwide. Gülen's aim is not altruistic: His followers target youth in the eighth through twelfth grades, mentor and indoctrinate them in the ışıkevi, educate them in the Fethullah schools, and prepare them for future careers in legal, political, and educational professions in order to create the ruling classes of the future Islamist, Turkish state. Taking their orders from Fethullah Gülen, wealthy followers continue to open schools and ışıkevi in what Sabah columnist Emre Aköz called "the education jihad." The overt network of schools is only one part of a larger strategy. In a 2006 interview, Veren said, "These schools are like shop windows. Recruitment and Islamization activities are carried out through night classes ... Children whom we educated in Turkey are now in the highest positions. There are governors, judges, military officers. There are ministers in the government. They consult Gülen before doing anything." The AKP's controversial education policies, coupled with the Islamist indoctrination in Fethullahist schools, have accelerated the Islamization of Turkish society. During AKP's first term in government, the Erdoğan government has changed textbooks, emphasized religion courses, and transferred thousands of certified imams from their positions in the Directorate of Religious Affairs to positions as teachers and administrators in Turkey's public schools. Abdullah Gül, Turkey's first Islamist president and a Gülen sympathizer, appointed a Gülen-affiliated professor, Yusuf Ziya Özcan, to head Turkey's Council of Higher Education (Yükseköğretim Kurulu, YÖK). He has also used his presidential prerogative to appoint Gülen sympathizers to university presidencies. Beyond Turkey, the Fethullahist schools also serve as fertile recruiting grounds. In his Institut d'Etudes Politiques doctoral thesis on Gülen schools in Central Asia, Bayram Balcı, a French scholar of Turkish origin, wrote, "Fethullah's aim is the Islamization of Turkish nationality and the Turcification of Islam in foreign countries. Dozens of Fethullah's ‘Turkish schools' abroad—most of which are for boys—are used to covertly ‘convert,' not so much ‘in school,' but through direct proselytism ‘outside school.'" Balcı explained, "He wants to revive the link between state, religion, and society." The schools of Gülen's Nur movement in Central Asia have worked to reestablish Islam in a region largely secularized by decades of Soviet control. Balcı explained, "The aim of the cemaat is to educate and influence future national elites, who will speak English and Turkish and who will one day prove their good intentions towards Fethullahists and towards Turkey." Several countries in the region have taken steps against Gülen's educational institutions because of such suspicions. Uzbekistan has banned the schools for encouraging Islamic law, and the Russian government, weary of the movement's activities in majority Muslim regions of the federation, has banned not only the Gülen schools but all activities of the entire Nur sect in the country. Neither Uzbekistan nor Russia are known for their pluralism, but suspicion about Gülen indoctrination has spread even to more permissive societies such as that of the Netherlands. In 2008, members of the Netherland's Christian Democrat, Labor, and Conservative parties agreed to cut several million euros in government funding for organizations affiliated with "the Turkish imam Fethullah Gülen" and to thoroughly investigate the activities of the Gülen group after Erik Jan Zürcher, director of the Amsterdam-based International Institute for Social History, and five former Gülen followers who had worked in Gülen's ışıkevi told Dutch television that the Gülen community was moving step-by-step to topple the secular order. While the organizations in question denied any ties to the Gülen movement, Zürcher said that taqiya, religiously-sanctioned dissimulation, was typical in the movement's interactions with the West. An unnamed former Gülen follower who also once worked in Gülen schools and ışıkevi reported that Fethullahists called the Dutch "filthy, blasphemous infidels" and that they said "the best Dutchman is one who has converted to Islam. All the Dutch must be made Muslims." Indeed, of the thousands of Fethullahist schools in more than one hundred countries that allegedly teach moderation, none are located in countries such as Saudi Arabia or Iran that exist under domineering strains of official Islam, and most appear instead geared to radicalize students in secular Muslim and non-Muslim societies. Fethullahists began organizing inside the security apparatus in the 1970s. In police academies, students were being taken to ışıkevi by class commissioners. One of those commissioners is now the director of intelligence at the Turkish Directorate of Security. During my time at the [police] academy, those in the directorate who did not have ties to the [Gülen] organization were all pensioned off or fired in 2002 when the AKP came to power. … I was at the top of my class when I graduated from the police academy, and throughout the twenty-four years of my career, I maintained and was honored for my stellar record. After 2002, the AKP blocked my promotions. They promoted only those officers whose files were tainted with allegations that they were engaged in reactionary Islamist activities. … Belonging to a certain cemaat has become a prerequisite for advancement in the force. At present, over 80 percent of the officers at supervisory level in the general security organization are members of the [Gülen] cemaat. Such statements, however, may have consequences. In October 2008, Turkish police arrested Saçan on suspicion of involvement in the so-called Ergenekon plot to overthrow the Turkish state. Most Turkish analysts believe that the Ergenekon conspiracy, short of any evidence of unconstitutional activities, is more a mechanism by which the Turkish government can harass critics. Wiretapping scandals in spring 2008 also highlighted Gülenist penetration of the security service's most important units. After the Turkish Security Directorate obtained a blanket court permit in April 2007 to monitor and record all the communications in Turkey including mobile and land-line telephones, SMS text messaging, e-mail, fax, and Internet communications, Turks have grown uneasy about having telephone conversations fearing intrusion into their privacy. Recent leaks to pro-AKP media of recordings of military personnel meetings, lectures, top secret military documents, strategic antiterrorism plans, private medical files of commanders, and contents of personal conversations between state prosecutors have shocked the nation as has the appearance on the Internet video site YouTube of some of those recordings. The alleged network of Fethullah followers in the security system has an impact on domestic affairs as they use restricted technology or privileged information to further their political agenda. In February 2008, for example, several websites posted the voice recording of a secret speech delivered by Brig. Gen. Münir Erten announcing the timing of an upcoming Turkish military operation into Iraqi Kurdistan, details of a private discussion with the chief of the General Staff, and private information concerning Gen. Ergin Saygun's health. The following month, several websites including YouTube posted a secretly recorded conversation between prosecutor Salim Demirci and a colleague regarding Erdoğan and Efkan Ala, then governor of Diyarbakir and subsequently a counselor of Erdoğan's office. Erdoğan responded by ordering a criminal investigation against Demirci. In June 2008, the Islamist Vakit published Saygun's entire medical file, disclosing information about his diabetes as well as the treatments and medications he had received in the Gülhane military hospital. Others whose tapped conversations appeared on Islamist websites and in Gülen's newspaper network included Erdoğan Teziç, the former head of Turkey's Higher Education Council, and prominent members of the center-left opposition Republican People's Party (Cumhuriyet Halk Partisi, CHP). Many Turkish journalists believe that Fethullahist-dominated police tap their communications, and according to reports, the head of the wiretapping unit, who was appointed by Erdoğan in August 2005, is a Fethullah follower. Islamist newspapers including Vakit, Yeni Şafak, Zaman, and the pro-AKP Taraf published leaks from private conversations held inside government offices and military headquarters. The Islamist, pro-AKP media has reported alleged confidential evidence relating to the police investigation of the so-called Ergenekon plot that posits a secularist cabal of military officers, journalists, and professors sought to overthrow the AKP government. The net effect of such leaks is to tar the reputations of or intimidate AKP's political opponents and the Turkish military. Islamization within police ranks also contributes to police brutality against anti-AKP demonstrators. On May 1, 2008, the police used gas bombs, pepper gas, water cannons, and clubs against workers who wanted to celebrate May Day peacefully in Istanbul's Taksim Square, the traditional site of demonstrations in Turkey's largest city; scores were injured. Labor unions and opposition parties condemned the police brutality and accused Erdoğan of using police to silence opposition voices. Police also suppressed labor protests in Tuzla (Istanbul) shipyards. Similarly, police have harassed individual citizens after they criticized Erdoğan's policies. Erdoğan's own security guards abducted a 46-year-old man from Antalya for speaking out in public against his social security policies, taking the man to a deserted location where the guards beat and threatened him. The victim alleged that his attackers said they could easily plant guns or drugs on him and kill him. The Fethullahist military officers were once our students, who we financially supported, educated, and assisted. When these grateful children graduated and reached influential positions, they put themselves and their positions at the service of Fethullah Gülen … [Gülen] directs and instructs, and, through them, maintains power within the state … When Gülen's students graduate from the police or military academies—as do the new doctors and lawyers—they present their first salaries to Fethullah Gülen as a gesture of their gratitude. Newly graduated officers even bring him the swords that they receive during the graduation ceremony. According to Veren, Gülen has argued that the military expels no more than one in forty Islamist officers; the rest remain in undercover cells. While such allegations may seem the stuff of conspiracy theory, recent leaks to pro-AKP media suggest a number of Islamist sources within the military ranks, creating speculation that followers of Gülen now populate the senior infrastructure of the Turkish General Staff. Such speculation gained additional credence after the August 2008 Supreme Military Council (Yüksek Askeri Şura, YAŞ), which, for the first time, declined to expel suspected Islamists from military ranks. The AKP government has also aided the Gülen movement with its reorientation of the judiciary. Over the first five years of his rule, Erdoğan replaced thousands of judges and prosecutors with AKP appointees. Now that the president is Islamist, it is unlikely that he would veto the appointment of Islamists to the bench, as did his predecessor Ahmet Necdet Sezer. Indeed, it now appears that the government intends to appoint thousands more to judicial positions. The AKP has also enacted a law that would require applicants for judgeships to first interview with AKP bureaucrats in order better to gauge and adjudicate applicants' adherence to Islam. The results of the AKP's targeting of the judicial system are already apparent as anti-secular, pro-AKP officials have been at the forefront of some controversial trials, such as the case against Van University president Yücel Aşkın, the Şemdinli investigation in which the prosecutor tried to implicate Gen. Yaşar Büyükanıt before he became chief of the General Staff, and, most recently, the Ergenekon probe. Indeed, it is such overtly political and vindictive prosecutions that have led some former Gülen sympathizers, such as University of Utah political scientist Hakan Yavuz, to a change of heart. In one interview, Yavuz told odatv.com that four important legal cases had changed his thinking: the case against Aşkın; the Semdinli case; the Atabeyler operation, uncovered in 2005, involving an organized crime group with alleged plans to assassinate Prime Minister Erdoğan; and the Ergenekon probe. Yavuz explained, "The cemaat has attempted to steer all four cases. Look at the slanderous reports in archives of the cemaat's newspapers, how they defamed Yucel Aşkın. And now it's Ergenekon. Keeping [prominent] personalities in jail for over a year without indictment is inexplicable." Yavuz also suggested Gülen's cemaat spoke differently to its members than to outsiders and that it was pursuing a political agenda that conflicted with the founding philosophy of the modern Turkish republic. He accused Fethullahists of "co-optation" and said that they were recruiting people and paying them money—without any formal receipts or records—to write and speak favorably about the movement while criticizing the secular Turkish state. If the police, military, and courts might normally protect rule-of-law from within official Turkish government structures, there might still be an external check to abuse of power in the Turkish media. The Turkish media has traditionally been relentless in its reporting of abuses of power and corruption. Soon after assuming office, however, Erdoğan proved intolerant of the concept of a free press. The AKP government has systematically sought to create a media monopoly to speak with one voice and on behalf of the government. Erdoğan lashes out at media organs that he does not control. In his first term, Erdoğan brought more than a hundred lawsuits against sixty-three journalists in sixteen publications, against many writers, as well as the leaders and members of parliament of all opposition parties. The number of lawsuits may be far greater. In 2008, Erdoğan declined to answer a parliamentary inquiry by a Democratic Left Party deputy demanding information on how many lawsuits Erdoğan had initiated against journalists—claiming that such information was in the realm of his private life." Most of Erdoğan's lawsuits against journalists involve criticism that any other democracy would consider legitimate. In 2005, for example, he sued Cumhuriyet cartoonist Musa Kart for depicting him as a cat entangled in a ball of string. Last year, he sued the LeMan weekly humor magazine for ridiculing him in its January 30, 2008 cover. Erdoğan lost some of his lawsuits, and courts threw out others, but the effect has nonetheless been chilling. Journalists know that not only does the prime minister seek to make them financially liable for any criticism, but that the AKP might even seek to assume control of their publications. During AKP's 6-year rule, the government has seized control of several media outlets and subsequently sold them to pro-AKP holdings affiliated with the Gülen community. In April 2007, for example, the governmental Saving Deposit Insurance Fund (Tasarruf Mevduatı Sigorta Fonu, TMSF) seized Sabah-ATV, Turkey's second largest media group in a predawn raid. The TMSF, staffed by Erdoğan appointees, then sold the group to Çalık Holding, the CEO of which is Erdoğan's son-in-law. Çalık financed the purchase with public funds taken as loans from two state-owned banks and by partnering with a newly-founded, Qatar-based media company that bought 25 percent of Sabah shares. It was Abdullah Gül who introduced Ahmet Çalık to Qatari Emir Hamad bin Khalifa during his January 2008 visit in Syria; Çalık also accompanied Gül in February and Erdoğan in April when they visited Qatar. Media reports indicated that other consortiums that had initially shown interest in purchasing Sabah-ATV with their own money pulled out of the tender shortly before the bid after Erdoğan contacted them, leaving Çalik the sole bidder. Sabah has since become a strong advocate of the AKP government. In September 2008, Erdoğan demanded all party members and aides boycott newspapers owned by the Doğan Media Group after it reported on laundering of money to Islamist charities. Excluding the Islamist television and radio stations, newspapers such as Zaman, Sabah, Yeni Şafak, Türkiye, Star, Bugün, Vakit, and Taraf all have AKP and/or Gülen-affiliated ownership. By circulation, such papers represent at least 40 percent of all newspaper sales in Turkey. Conglomerates have long had a dominant position in Turkish society. Secular businessmen such as Aydın Doğan and Mehmet Emin Karamehmet have interests not only in industry but also in media, the banking sector, and even education. Never before, though, has a single individual started a movement that seeks to transform Turkish society so fundamentally. Gülen now wields a vocal partisan media; a vast network of loyal bureaucrats; partisan universities and academia; partisan prosecutors and judges; partisan security and intelligence agencies; partisan capitalists, business associations, NGOs, and labor unions; and partisan teachers, doctors, and hospitals. What makes Gülen so dangerous? Gülen's own teaching and sermons provide the best answers. When everything was closed and all doors were locked, our houses of isik [light] assumed a mission greater than that of older times. In the past, some of the duties of these houses were carried out by madrasas [Islamic schools], some by schools, some by tekkes [Islamist lodges] … These isik homes had to be the schools, had to be madrasas, [had to be] tekkes all at the same time. The permission did not come from the state, or the state's laws, or the people who govern us. The permission was given by God … who wanted His name learned and talked about, studied, and discussed in those houses, as it used to be in the mosques. Now it is a painful spring that we live in. A nation is being born again. A nation of millions [is] being born—one that will live for long centuries, God willing … It is being born with its own culture, its own civilization. If giving birth to one person is so painful, the birth of millions cannot be pain-free. Naturally we will suffer pain. It won't be easy for a nation that has accepted atheism, has accepted materialism, a nation accustomed to running away from itself, to come back riding on its horse. It will not be easy, but it is worth all our suffering and the sacrifices. The philosophy of our service is that we open a house somewhere and, with the patience of a spider, we lay our web to wait for people to get caught in the web; and we teach those who do. We don't lay the web to eat or consume them but to show them the way to their resurrection, to blow life into their dead bodies and souls, to give them a life. Many Gülen supporters and members of the Islamist media affiliated with the cemaat suggested the sermons were somehow forged but the denials are unconvincing given the video footage and reports by Gülen movement defectors. U.S. Government Support for Gülen? Many Turkish analysts believe that, prior to Erdoğan's election, Gülen and his supporters in the U.S. government helped obtain an invitation to the White House for him at a time when Erdoğan was banned from politics in Turkey due to his Islamist activities—an event viewed as a U.S. endorsement ahead of the 2002 Turkish elections. That the U.S. government and, specifically, the Central Intelligence Agency support the Gülen movement is conventional wisdom among Turkey's secular elite even though no hard evidence exists to support such allegations. When Turkish secularists are asked to defend the view that Gülen enjoys U.S. support, they often point to his almost 20-year residence in eastern Pennsylvania. After the Supreme Court of Appeals in Turkey (Yargıtay) confirmed on June 24, 2008, a lower court's ruling to acquit Gülen on charges that he organized an illegal terrorist organization to overthrow the secular government in Turkey, Gülen won another legal battle, this time in the United States. A federal court reversed U.S. Department of Homeland Security and U.S. Citizenship and Immigration Service decisions that would have denied Gülen's application for permanent residency in the United States on the basis that Gülen did not fit the criteria as someone with "extraordinary ability in the field of education." The Department of Homeland Security characterized Gülen as neither an expert in the field of education nor an educator but rather as "the leader of a large and influential religious and political movement with immense commercial holdings." While the court ruling that allowed Gülen to remain in the United States may provide fodder for Turkish analysts who suggest U.S. support for Gülen, the process is actually more revealing. Indeed, the U.S. government noted that much of the acclaim Gülen touts is sponsored or financed by his own movement. Gülen attached twenty-nine letters of reference to his June 18, 2008 motion, mostly from theologians or Turkish political figures close to or affiliated with his organization. John Esposito, founding director of the Saudi-financed Prince Alwaleed Bin Talal Center for Muslim-Christian Understanding, who, after receiving donations from the Gülen movement sponsored a conference in his honor, also supplied a reference. Two former CIA officials, George Fidas and Graham Fuller, and former U.S. ambassador to Turkey Morton Abramowitz also supplied references. The letters may have worked. On July 16, 2008, U.S. district judge Stewart Dalzell issued a memorandum and order granting Gülen's motion for partial summary judgment and ordering the U.S. Citizenship and Immigration Service to approve his petition for alien worker status as an alien of extraordinary ability by August 1, 2008. The court found that the immigration examiner improperly concluded that the field of education was the only statutory category in which Gülen's accomplishments could fit and that Gülen's accomplishments in such fields as theology, political science, and Islamic studies should also be considered. The court further determined that the U.S. Citizenship and Immigration Service Administrative Appeals Office erred in concluding that Gülen's work was not "scholarly" by applying an unduly narrow definition of the term. Finally, with regard to the statutory requirement that the applicant show that his or her entry into the United States would substantially benefit the United States, the court found that Gülen had met the requirement. Regardless of the legal rationale behind his current stay, the U.S. decision to grant Gülen residency will enable his movement to continue to imply Washington's endorsement as the AKP and its Fethullahist supporters seek to push Turkey further away from the secularism upon which it was built. Gülen enjoys the support of many friends, ideological fellow-travelers, and co-opted journalists and academics. Too often, concern over Gülen's activities is dismissed in the Turkish, U.S., and European media as mere paranoia. When Turkey's chief prosecutor indicted the AKP for attempting to undermine the secular constitution, the pro-Islamist media in Turkey along with Western diplomats and journalists dismissed the case as an "undemocratic judicial coup." Yet at the same time, many of the same outlets and officials have hailed the Ergenekon indictment, assuming a dichotomy between Islamism and democracy on one hand, and secularism and fascism on the other. The repeated branding in Islamist outlets of Turkey's Islamists as "reformist democrats" and of modern, secular Turks as "fundamentalists" has to be one of the most offensive but sadly effective lies in modern politics. Indeed, Turkey has never seen a single incident of attacks on pious Muslims for fasting during Ramadan, whereas in recent years there have been many incidents of attacks on less-observant Turks for drinking alcohol or not fasting. While women who cover their heads in the Islamic manner can move freely in any area of the country, uncovered women are increasingly unwelcome in certain regions and are often attacked. Contrary to the impression prevalent in the West—that the conflict is between religious Muslims and "anti-religion, secular Kemalists"—the fact remains that the majority of Turks, secular included, are traditional and observant Muslims many of whom define themselves primarily as "Muslims first." While the Turkish constitution recognizes all Turkish citizens as "Turks," the dominant sentiment in the country has always been that in order to be considered a Turk, one must be Muslim. The complete absence of any non-Muslim governor, ambassador, or military or police officer attests to the prevalence of Islam's dominance in the Turkish establishment. Therefore, it appears Gülen is not fighting for more individual freedoms but to free Islam from the confines of the mosque and the private domain of individuals and to bring it to the public arena, to govern every aspect of life in the country. AKP leaders, including Gül and Erdoğan, have repeatedly expressed their opposition to the "imprisonment of Islam in the mosque," demanding that it be present everywhere as a lifestyle. Most Turks vividly remember statements by AKP leaders not long ago rejecting the definition of secularism as "separation of mosque and state." Gül has slammed "secularism" on many occasions, including during a November 27, 1995 interview with The Guardian. What Turkey's Islamists really want is to remove the founding principles of the Turkish Republic. So long as U.S. and Western officials fail to recognize that Gülen's rhetoric of tolerance is only skin-deep, they may be setting the stage for a dialogue, albeit not of religious tolerance, but rather to find an answer to the question, "Who lost Turkey?" Rachel Sharon-Krespin is the director of the Turkish Media Project at the Middle East Media Research Institute (MEMRI), Washington D.C.
 Can Dündar, Milliyet (Istanbul), June 21, 2007; Reha Muhtar, Vatan (Istanbul), June 22, 2007. Milliyet, Mar. 10, 2008; Hürriyet (Istanbul), Mar. 10, 2008. Helen Rose Ebaugh and Dogan Koc, "Funding Gülen-Inspired Good Works: Demonstrating and Generating Commitment to the Movement," fgulen.com, Oct. 27, 2007. Merdan Yanardağ, Fethullah Gülen Hareketinin Perde Arkasi, Turkiye Nasil Kusatildi? (Istanbul: yah Beyaz Yayın, 2006), based on interviews with Nurettin Veren on Kanaltürk television, June 26, July 3, 2006. "Fethullah Gülen Is an Islamic Scholar and Peace Activist," International Conference on Fethullah Gülen, Erasmus University, Rotterdam, The Netherlands, Nov. 2007; J. J. Rogers, "Giants of Light: Fethullah Gülen and Meister Eckhart in Dialogue," The University of Texas, San Antonio, Tex., Nov. 3, 2007. See for example, Rogers, "Giants of Light"; USA Today, July 18, 2008. Bülent Aras, "Turkish Islam's Moderate Face," Middle East Quarterly, Sept. 1998, pp. 23-9. Anadolu Ajansı (Ankara), Feb. 10, 1998. Booklets on Anatolian Sufism with citations from Mevlana Celleddin Rumi distributed at the "Muslim World in Transition: Contributions of the Gulen Movement" conference, London, Oct. 25 – 27, 2007. Aland Mizell, "Clash of Civilizations versus Interfaith Dialogue: The Theories of Huntington and Gulen," KurdishMedia.com, Dec. 31, 2007; idem, "Are Islam and Kemalism Compatible? How Two Systems Have Impacted the Kurdish Question?" Iraq Updates, Nov. 28, 2007. Interview with Nurettin Veren, Kanaltürk television, June 26, 2006. Sabah (Istanbul), Dec. 30, 2004. Veren interview, Kanaltürk, June 26, 2006. Cumhuriyet (Istanbul), Dec. 23, 2007. Bayram Balcı, "Central Asia: Fethullah Gulen's Missionary Schools," Oct. 2001. Interview with Merdan Yanardağ, Gerçek Gündem (Istanbul), Nov. 20, 2006. Erik-Jan Zürcher, "Kamermeerderheid Eist Onderzoek Naar Turkse Beweging," NOVA documentary, July 4, 2008. Cumhuriyet, July 9, 2008; Netherlands Information Services, July 11, 2008. Yanardağ, Fethullah Gülen Hareketinin Perde Arkasi, Turkiye Nasil Kusatildi? Adil Serdar Saçan, interview, Kanaltürk, July 3, 2006. Samanyolu television, Oct. 13, 2008. See, for example, Michael Rubin, "Erdogan, Ergenekon, and the Struggle for Turkey," Mideast Monitor, Aug. 2008. Yanardağ interview, Gerçek Gündem, Nov. 20, 2006. Vatan, June 2, 2008; Hürriyet, June 2, 2008. "SOK! Tuggeneral Munir Erten den SOK aciklamalar!" accessed Oct. 27, 2008. "Sok Video! Cumhuriyet Savcisi Salim Demirci," accessed Oct. 27, 2008. Vakit (Istanbul), June 14, 2008. BBC News, Feb. 4, 2008; Frank Hyland, "Investigation of Turkey's ‘Deep State' Ergenekon Plot Spreads to Military," Global Terrorism Analysis, Jamestown Foundation, July 16, 2008. Vatan, May 2, 2008; Milliyet, May 2, 2008; Hürriyet, May 2, 8, 2008. "Turkish Judiciary at War with AKP Government to Defend Its Independence," MEMRI Special Dispatch No. 1520, Mar. 27, 2007. "The AKP Government's Attempt to Move Turkey from Secularism to Islamism (Part I): The Clash with Turkey's Universities," MEMRI Special Dispatch No. 1014, Nov. 1, 2005; "Professor from Van University in Turkey Commits Suicide after Five Months in Jail without Trial," MEMRI Special Dispatch No. 1025, Nov. 18, 2005. Zaman (Istanbul), Apr. 18, 2008. Odatv.com, May 30, 2008; Hürriyet, June 13, 2008; Akşam (Istanbul), June 16, 2008. Radikal (Istanbul), Apr. 7, 2008. Hürriyet, Sept. 7, 8, 9, 10, 11, 12, 2008. Turkish channel ATV, June 18, 1999. Ibid. ; "The Upcoming Elections in Turkey (2): The AKP's Political Power Base," MEMRI Inquiry and Analysis No. 375, July 19, 2007. Sabah, Jan. 2, 3, 2005. "Fethullah Gulen v. Michael Chertoff, Secretary, U.S. Dept. of Homeland Security, et al," Case 2:07-cv-02148-SD, U.S. District Court for the Eastern District of Pennsylvania. Turkish Daily News (Ankara), Mar. 16, 2008; Vakit, June 7, 9, 2008; Yeni Şafak (Istanbul), June 9, 2008. Mustafa Akyol, "The Threat Is Secular Fundamentalism," International Herald Tribune, May 4, 2007; "Islam Will Modernize—If Secular Fundamentalists Allow," Turkish Daily News, May 15, 2007; "Mr. Logoglu Is Wrong, Considerably Wrong about Turkey," Turkish Daily News, May 24, 2007. Vatan, Aug. 21, 2008; Turkish Daily News, Sept. 23, 2008. Hürriyet, Feb. 14, 2008; Milliyet, Feb. 14, 2008; Vatan, Feb. 14, 2008, Cumhuriyet, Feb. 14, 2008. Yeni Şafak, July 7, 2006. "Turkish PM Erdogan in Speech during Term as Istanbul Mayor Attacks Turkey's Constitution, Describing It as ‘A Huge Lie': ‘Sovereignty Belongs Unconditionally and Always To Allah'; ‘One Cannot Be a Muslim and Secular,'" MEMRI Special Dispatch No. 1596, May 23, 2007. Related Topics: Radical Islam, Turkey and Turks | Winter 2009 MEQ receive the latest by email: subscribe to the free mef mailing list This text may be reposted or forwarded so long as it is presented as an integral whole with complete and accurate information provided about its author, date, place of publication, and original URL.